On this past election night, while most of us sat stunned at the presidential election results, a little-watched vote tally toward the bottom of the ballot had a big impact – at least in New Orleans – and could eventually influence other jurisdictions nationwide. There were three contested elections for the Orleans Parish School Board. At issue were charter schools. The board will be taking over all the public schools that were transferred to the state-run Recovery School District after the Katrina disaster. During the past decade the concept of charter schools has become more popular, though not with unions, which have lost leverage with the more autonomous charter schools. We support the charter concept because it gives individual schools more flexibility, and allowing freedom in school selection creates more competition among schools. Under a charter system a bad school cannot survive at a dead-end while special interests get rich at the expense of students. 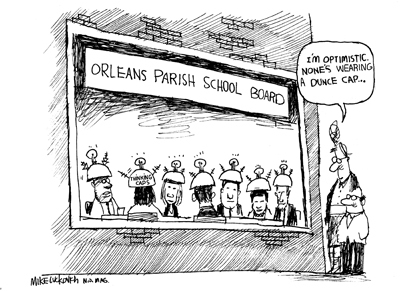 One of the most incredible developments in the city over the past decade is that the Orleans Parish Public School System, once considered among the nation’s worst, has become a model for reform. On election night, the pro-charter faction of the board emerged victorious with at least a four-vote majority on the seven-member board. We remember when television coverage of Monday night school board meetings could have been the equivalent of the Monday night fights. We hope for a more enlightened school board now. And with that could come a more enlightened citizenry.